A precipitous drop in temperatures from the 90s (34C) to the 40s (6C) last night, warming to the low 60s (17C) this afternoon, made for ideal conditions to visit the stone chambers around Putney, Vermont. My Druid friend B. was my guide. The roads around Putney Mountain are not always well-labelled, many run through private lands, and some of the many dirt roads devolve to Class 4 — not regularly maintained, generally not passable without all-wheel drive vehicles, and not plowed in winter. We drove where we could, then set out on foot. Here B. stands next to the entrance of the first chamber, giving an approximate sense of the height of the mouth. A side view of the same chamber. Note the stone wall climbing the hillside in the background. The chamber features a drainage (?) channel cut into the rock. All of the chambers face roughly east, and this particular channel runs due east, judging by readings from B’s smart-phone compass app. V-shaped entrance to chamber 2 — note what appears to be a stone “lintel” in the foreground. B crouched within chamber 2 — larger than chamber 1, and quite dry inside. The massive roof plates of stone easily weigh several tons each. Looking out from within chamber 2. Unlike the first chamber, this one was dry enough to sit on the earth floor. Chamber 3 differs in the location of the entrance. Here is what looked and felt to both of us like a “processional walk” to the chamber. Merely a path left from frequent hikers exploring the area? Or something else? How to tell? Continuing the approach to chamber 3. B standing at the roof entrance to chamber 3 for a sense of scale. The beech (?) to the left appeared at least two hundred years old. Close-up of the kiva-like entrance to chamber 3. The interior is deep enough for a person to stand upright in the oval space, about 8 feet (2.4 m) across. Chamber 4 — the roof has fallen in on the far side. Stone taken for building elsewhere? Similar design to the others — but perhaps run-off from hillside weakened the roof. Despite both learned and amateur speculation, no convincing conclusions about the purpose of these chambers exists. Colonial smokehouses? Storage sheds? Native ritual or burial chambers? Nothing quite seems to explain the massive construction, cramped and damp spaces, the exceptions of the details of chambers 2 and 3, etc. Similar stoneworks around New England raise similar questions. While dating suggests pre-European construction in some locations, other sites present what appears to be intermingled periods of building/repair. East Coast Gathering’s host camp. Photo courtesy Krista Carter-Smith. Once again the Tribe — as many as could attend — converged on a hilltop in northeastern Pennsylvania near the autumn equinox for the 2017 OBOD East Coast Gathering. Some travelers contended with the after-effects of Hurricane Irma, others with more personal challenges. If you can make the effort, you experience the reward. This year featured a Croning Ritual honoring nine women who requested this rite of passage, and a coming of age ritual for a young member. As Druid (and other Pagan) groups mature, similar opportunities will continue to arise to commemorate and honor such capstone events of our lives. The spirits of the Land know us and often have a message for those among us who can hear them. And this weekend in particular we were urged simply to listen — more on that later. The Land near ECG. Photo courtesy Gerfalc Hun. The overriding theme this year, twinned with our official theme “Discovering Awen: The Bardic Arts”, was clearly gratitude. Our delight poured forth on the several Facebook pages we frequent. Again and again, attendees wrote of their thanks to others for simply coming. With their presence and conversation, workshops and smiles, they reminded us of the beauty, fellowship and vitality of our chosen path. Members of Mystic River Grove. Photo courtesy Dana Driscoll. This year marked my seventh Gathering in the PA hills. ECG opened its gates in 2010 and has subsequently given birth to the Gulf Coast Gathering and, last year, to MAGUS as well, the Mid-Atlantic Gathering (my review here). 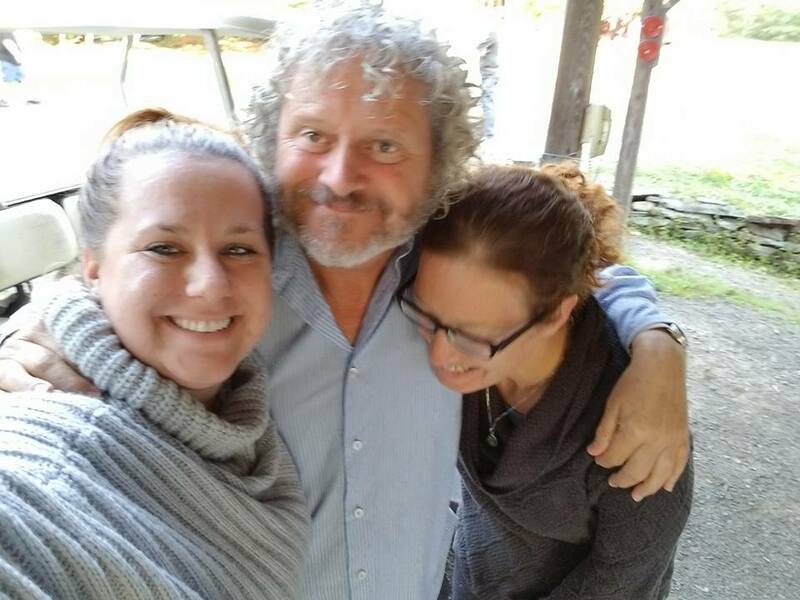 Once again the event sold out quickly, and once again part of the draw, besides reconnecting with friends, was our special guest, this year the Chosen Chief of OBOD, Philip Carr-Gomm. Philip and his wife Stephanie had been in the States longer this time. They’d just come off the previous weekend of giving workshops with the Green Mountain Druid Order in north central Vermont. Partly to honor the Chief, the Opening Ritual received special attention. Mystic River Grove, with members across New England, prepared thoroughly. Mystic River Grove prepares for Opening Ritual. Photo courtesy Gerfalc Hun. Because of a new job, Saturday was the only day I could attend, so I made the most of it, rising early and driving to camp to arrive at breakfast. Saturday included the main Equinox ritual, as well as a lunchtime talk by Philip, Ovate initiations, and as always the bonfires to draw the Tribe together after nightfall. I missed the Opening Ritual, ably led by Mystic River Grove, the oldest OBOD group in the States. The pictures hint at how marvelous it was. Brom putting the final touches on another masterpiece, with Alkandra helping. Photo courtesy Nadia Chauvet-Thanasoulas. Interior of a camp cabin — home for the Gathering. Photo courtesy Jo Ami. Cat and Gerfalc of Mystic River Grove in ritual garb as Owl and Moose. Photo courtesy Gerfalc Hun. Loam introduced us to the Indian practice of rangolee or kolam, a form of ritual painting with rice flour. Below you can see the rangolee ogham (a splendid merger of Hindu and Druid traditions!) taking shape in the fire circle. Loam and a friend laying rangolee, ritual painting with rice flour, around the firewood. Photo courtesy Gerfalc Hun. The unusual warmth of the weekend spurred me to stay robed from the afternoon ritual all the way through until the evening Ovate initiations. (Thank-you’s again to my wife for choosing a very breathable fabric when she fashioned my robe!) I’m sitting and gazing into the fire below. The rangolee remain vivid in firelight. After the Saturday evening Ovate initiations. Photo courtesy Steve Cole. Cat spearheaded the ritual planning and mask-making for Mystic River Grove’s Opening Ritual. Here she is as Owl. Photo courtesy Gerfalc Hun. Sarah F. as Salmon for Mystic River Grove’s Opening Ritual; she also served as Grove Mother during initiations. Her long-running astrology blog always has something to teach. Photo courtesy Gerfalc Hun. “Again the Labyrinth” — Cat gathers a team to set up the scores of electric tea lights in paper bags, switching them on and later off each night. Photo courtesy Steve Cole. “May the harmony of our circle be complete” go the words of standard OBOD ritual. If we’re growing at all as Druids, we keep getting reminded just how large our circle is. Those who attend the Camp before and after us each year all contribute their energies, and not everything meshes automatically. But in particular, Druids can imagine themselves more in tune than others, and this in turn can lead to an arrogant obliviousness to what the Land is actually saying, and to a disrespect of the expressed wishes of the non-human inhabitants. As guests, the messages ran, we can do better. As a result of the experience of past years and this year in particular, by both organizers and some attendees, and messages received from the land spirits of the Camp, next year’s Gathering will reflect a change in approach and perspective. These changes will appear on the ECG website. Listen, respect, celebrate. Old lessons, perennially new. Here’s to the spiral of 2018! Trees of Camp Netimus. Photo courtesy Elysia Cook. How to sing in a new land? Sing of it, o mortal. 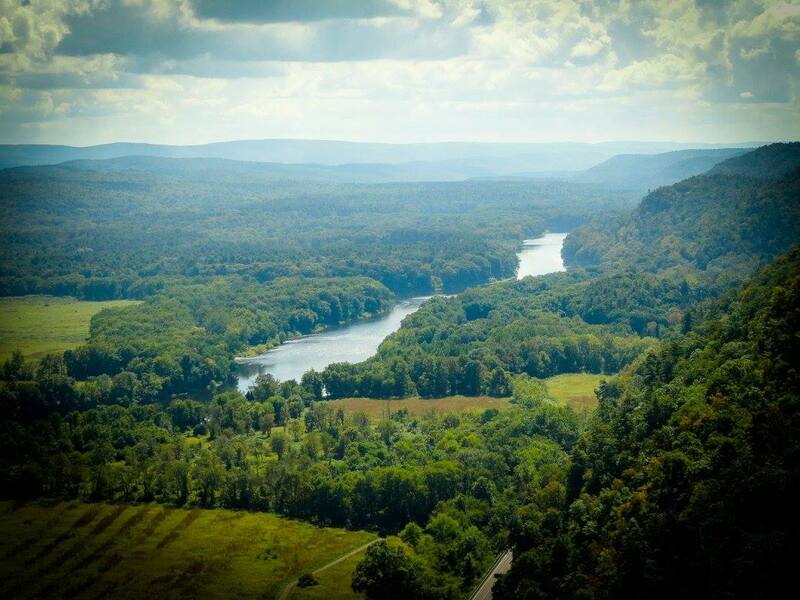 The New Jersey Geological Survey characterizes this region of Somerset County as “Devonian, conglomerate, sandstone, shale, limestone”. 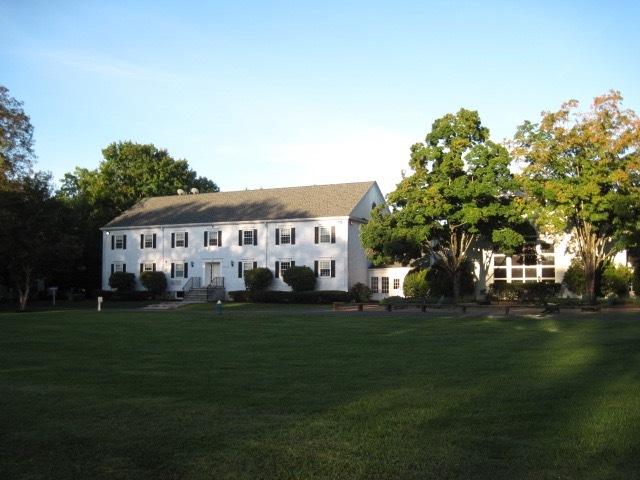 Not surprisingly from that description, the boarding school where my wife and I are living and teaching for the next year lies in “horse country”. 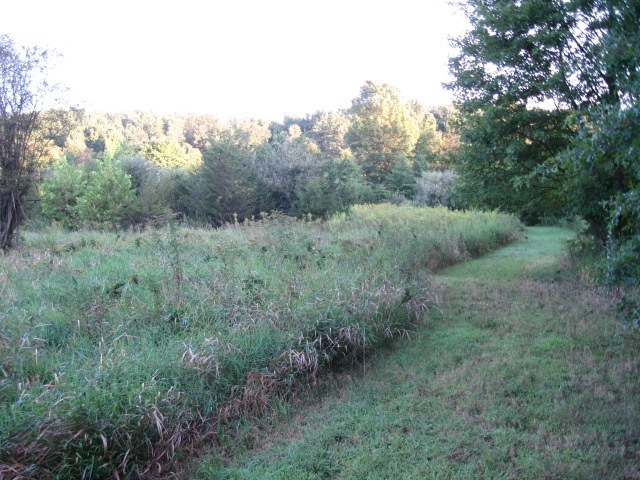 Equestrian clubs dot the area, and wealthy landowners with a desire for large tracts and quiet have helped preserve the area from further development. The gently rolling hills rise a mere 45 miles (72 km) west as the crow flies from Manhattan, yet the air is clean and green abounds. In return for claiming our lives pretty much 24/7 while term is in session (teaching, dorm parenting, coaching, advising, overnight duty, etc. ), the school grants us all good air to breathe and a green legacy of preservation, whatever its original motive. 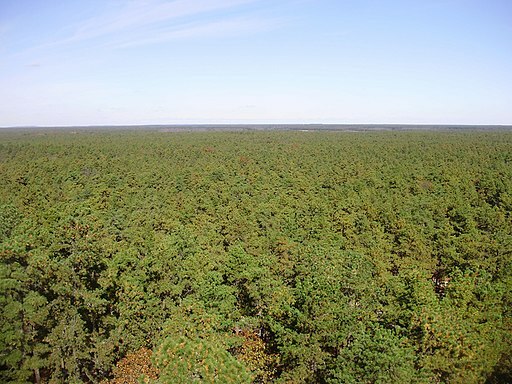 Despite its proximity to the sprawling metropolitan cities of Philadelphia and New York City right in the heart of the very densely populated Boston-Washington Corridor on the Eastern Seaboard, and the fact that the heavily travelled Garden State Parkway and Atlantic City Expressway run through it, the New Jersey Pine Barrens are largely rural and undisturbed. 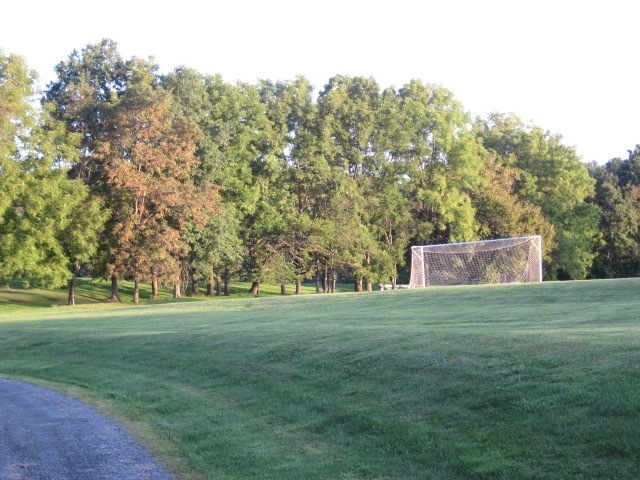 Our campus offers the usual vistas of playing fields and manicured greens, but vestiges of the original farm that became the school abound. 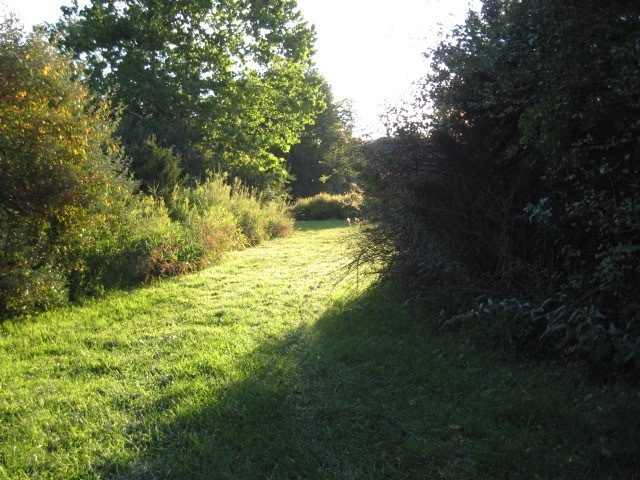 A sunrise walk brings you on small herds of white-tailed deer — frequent mowing means the vegetation is tender, and of course there’s no hunting on school grounds. In fact, we discovered on late evening walks that deer often bed down on the lawn of a faculty house on the campus periphery. 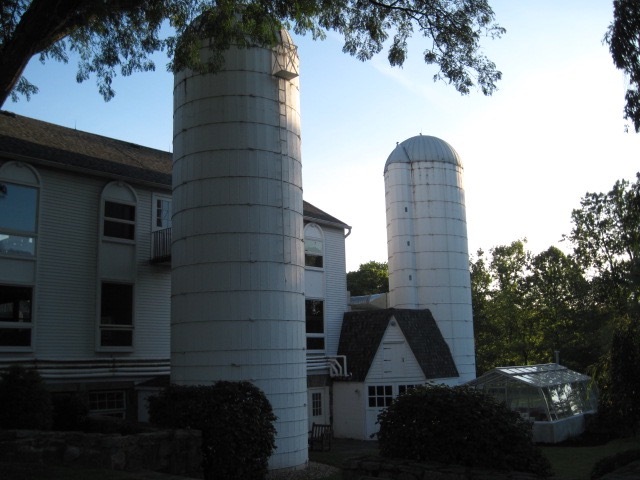 Two old silos remain standing next to the school library. 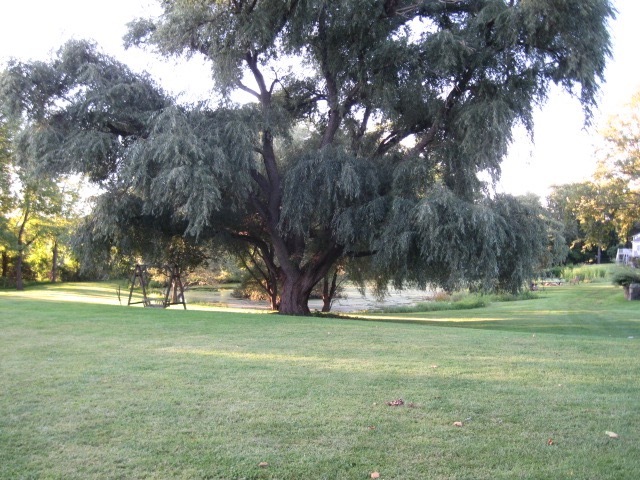 The fine old willow guarding a pond on the eastern campus. Sunrise walk on the northern part of campus. 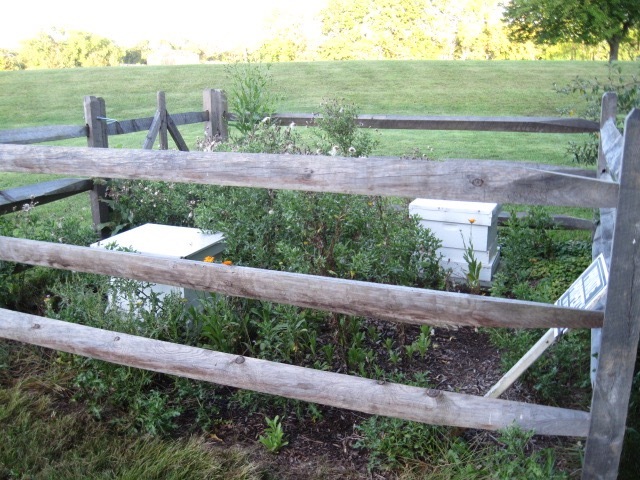 Who keeps the campus bees? Haven’t found out yet. Nothing against “education brick”, but this plain style feels less institutional. Sometimes it takes another country to teach you lessons about your own. Five summers ago while I was teaching English for a busy month in Seoul, Korea, I encountered a local land spirit who showed me that this lovely country I was just beginning to discover was decidedly not my home. It was about a week after I’d finally joined OBOD and requested the Bardic course. It was also my last weekend to explore Seoul and its environs before I flew back to the States to await that first of a series of welcome brown envelopes with the British postmarks of the OBOD course. So on a foggy Sunday morning I made my way by train toward Inwangsan, a sacred mountain a handful of kilometers from my one-room apartment in Seoul, and then on foot into the mist. Outside Dingninmun Station and under the overcast sky, I managed to miss the tourist signs and markers , but the mountain loomed nearby, unmistakable, so I began my ascent off trail, figuring I’d intersect it higher up, near where a Buddhist and shamanic shrine coexist peacefully. Inwangsan is famous for its commanding views and granite cliffs. As for the view, I had little hope for on this gray day, but exposed granite slabs and outcroppings shone slick in the rain. Forty-five minutes of climbing later, wet, muddy, and annoyed with myself, I paused to catch my breath. The fog had thickened, but the rising slope was still a reliable guide for the direction I wanted to go. I took a step, and –- how to describe it? –- up rose a wall of resistance in front of me. Something challenged me and barred my way from further ascent. At first I thought, stubborn and oblivious as I can be, that it was merely the tug of my own fatigue, but when I took another step it was clear this issued from something other than me. The hair on my arms stood up. Heart pounding, I apologized out loud, mumbled the few phrases of polite Korean I knew, turned around and slogged back down. What was it? I rarely see anything inwardly in such situations, but impressions came this time as I made my way off the slopes. Something with multiple arms, big as a pickup truck, banded in stripes of dark and light, and determined to block me from advancing any further. I’ve not written about this till now, and just putting it into words makes the feel of it march again up and down my spine, vivid as if it happened this morning, a heavy ascent of wet earth, a tang of juniper and Asian pine and dead leaves. Yet I’d forgotten the mountain’s name, and the train station’s, too, and had to consult my journal from that summer. That as much as anything reminded me yet again (as if I need any further sign) of my “outlander” status there: I did not know the proper names for things. 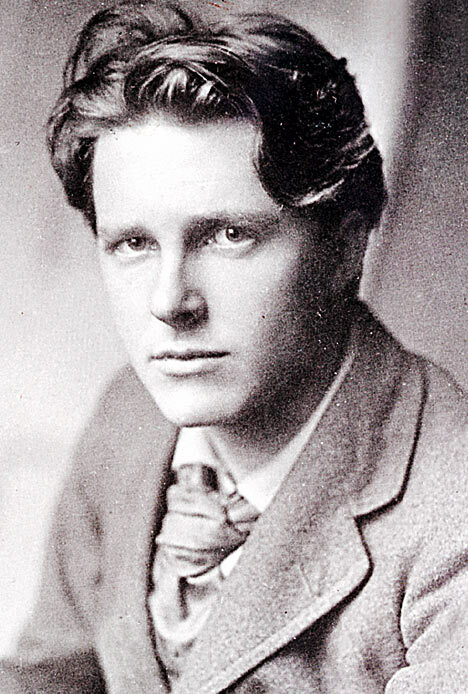 After British poet Rupert Brooke visited the Rocky Mountains some hundred years ago on a North American tour, he wrote: “There walk, as yet, no ghosts of lovers in Canadian lanes … it is possible, at a pinch, to do without gods. But one misses the dead” (Brooke, Letter XIII, “The Rockies”). Brooke was young – it was just a few years before his untimely death at 27 – and he wrote with a young bard’s flip ignorance to cloak his discomfort with an unfamiliar country. For of course ghosts walk this continent, millennia of them. Brooke simply hadn’t yet listened closely enough. But new landscapes often strike us that way. A Chinese proverb I heard while working in The People’s Republic of China sums it up handily: shui tu bu fu – “earth and water aren’t comfortable.” We don’t yet know them, and neither do they know us. But stay in a place long enough, sweat and sleep there, plant and harvest, raise families and bury your dead, and the land begins to learn you, too, and to recognize you. And as you work out names for the shapes of water and earth you find in the neighborhood, and come to greet the stones and trees as friends, the words get shaped by mouths that eat and drink here, by lungs that take in the local air. In the way of Bards, another who grappled with the same challenge comes to answer Brooke’s verses with words of his own. 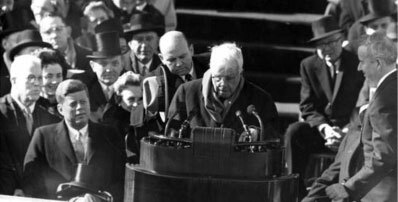 At 86, Robert Frost was asked to deliver a poem for President John F. Kennedy’s inauguration in January, 1961. The day dawned cold and bright, and with his failing vision and the sun in his eyes, Frost couldn’t read the words in front of him, so the old bard made do with memory instead, and recited another of his poems. Here in what homesick settlers called New England, older names still linger for things no one truly possesses. Within an hour from where I live you can find Mt. Monadnock, Mt. Ascutney, Wantastiquet Trail, Skatutakee and Nubanusit lakes. Anywhere you go on this continent, similar names and undercurrents whisper, and careful listening will repay any effort to attend to lore and myth and what the land wights may have to say. (The earth’s an old house: many lands have the same overlay of newer names on older ones.) Sometimes it takes long patience to regain their trust, if careless previous inhabitants squandered it. Sometimes it takes longer practice to stop withholding ourselves from our places, and to inhabit them fully. Here in Vermont the Yankee accent and sensibility rise like springwater from long winters and sap from local trees boiled to syrup, pork from free-range pigs that graze the oak mast on Windmill Hill, which we can see from our living room window, and Okemo State Forest not so very distant. “Eating local” needn’t be mere marketing of another yuppie indulgence. It’s what we all did until just a couple of generations ago, growing it ourselves, letting the land feed our bellies and spirits. And it makes sense if you’re committed to “Druiding” (let’s make it a verb!) –- the taste and smell of home, and of a new place, too, can be powerful guides. The body leads the way by a kind of homing instinct. Names, listening, tastes and smells. What of ritual and ceremony? Once my wife and I settled in Vermont, walking to learn my neighborhood became a go-to practice for me, with a three-mile loop of dirt roads my almost-daily ceremonial. When I honor the four quarters, I see the fish pond east of our house the former owners stocked with carp, and I remember water-of-air. The cold fronts each winter sweep down from Canada: air-of-earth. And with a hill named for a grove of hemlocks to our east beyond the pond that obscure the horizon, we never get much in the way of sunrises, but dramatic sunsets make up for it: fire-of-water. Online you can still track down Mike Nichols’ Wiccan classic “Re-thinking the Watchtowers: Thirteen Reasons Air Should Be in the North” (Nichols, 1989): it’s now a “sacred text” itself, though it started out as an observed deviation from traditional practice. Rules change with places, but ancient patterns abide. Frost, Robert. (1975). The Poetry of Robert Frost: The Collected Poems, Complete and Unabridged. New York: Henry Holt and Co.
Nichols, Mike. (1989). “Re-thinking the Watchtowers or 13 Reasons Air Should Be in the North.” Internet Sacred Text Archive. Retrieved from http://www.sacred-texts.com/bos/bos089.htm. IMAGES: Inwangsan by Gael Chardon; Rupert Brooke; Frost at JFK Inauguration. 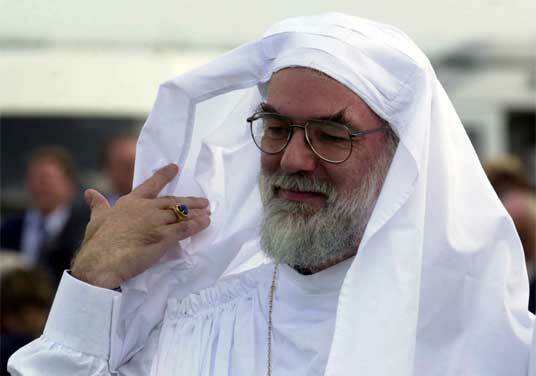 Some of you may recall a minor kerfluffle from the Christian Right a decade or so ago, when then Anglican Archbishop Rowan Williams joined the Welsh Gorsedd of Bards and appeared in — gasp! — “pagan” Druid robes and hood. One of the many ironies of that moment and others’ reactions to it is that of all Druid groups, the Welsh Gorsedd is among the most secular and the least woo-woo (a highly technical sociological term). I once suggested that one necessary contribution to a better awareness of these issues was to make sure we went out of doors in the wet from time to time (a suitable lesson from Noah…), and – if we haven’t got gardens of our own – make sure we took opportunities of watching the changing of the seasons on the earth’s surface. This may seem trivial compared with the high drama of ‘saving the world’; but if this analysis is correct, our underlying problem is being ‘dissociated’, and we ought to be asking constantly how we restore a sense of association with the material place and time and climate we inhabit and are part of. A transcript appears on the link page — it’s worth skimming for additional insights like this, a thoughtful and mature Christian grappling with the same realities we all face, and feeling his way into a diagnosis that accords with earth-centered insights and experiences — one that also doesn’t deny Christian wisdom either. 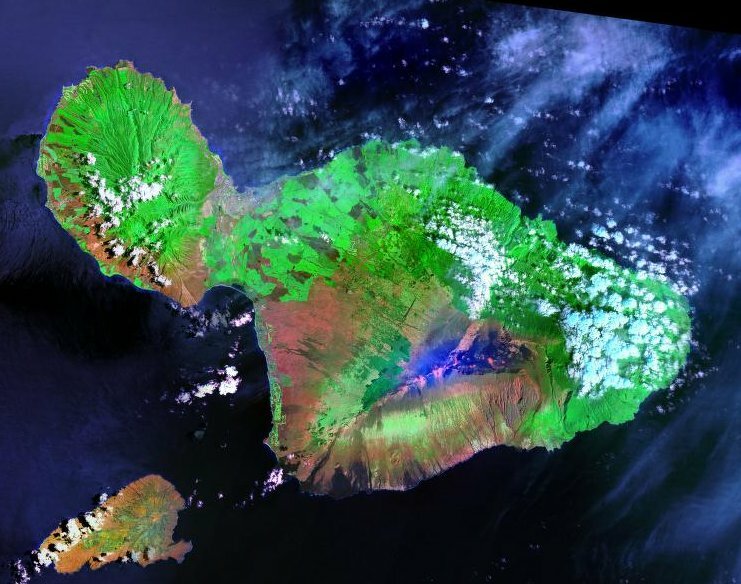 Maui — Landsat satellite view. Blue area is Haleakala — max. elev. 10, 023 ft.
Hi Lorna — thanks for your recent comment on “The Land is a Chief.” As usual, you dig beneath the surface and grapple with good challenges. You note, “To return … a sense of the sacred to landscapes … that have been viewed as profane” — that’s surely a major goal, if not one of THE central goals, of much Pagan and earth-based spirituality. At least I hope it is, or will be — it still feels like it’s in embryo form nowadays, in many places. Because there’s also a strong self-oriented strain that sometimes overshadows physical and spiritual work with the health of the land. It prioritizes self-fulfillment and personal realization and growth — important processes, yes — over the healing of the place(s) we find ourselves. Of course it shouldn’t be an either-or: “You can’t have one without the other.” Many people struggle with spiritual ills that are manifesting, among other forms, as health challenges. Our honoring and reverencing of the old gods and spirits is one healthy “symptom” of practices for healing the land AND ourselves. We can’t hear and communicate and work with them if we’re too out of balance with ourselves and the land. I wonder, though, how much we’ve romanticised “traditional” cultures for their practices and beliefs — beyond what the “average” person in those cultures may actually have done or thought or believed. But maybe such romanticizing is part of a healthy corrective, needed today, to help re-balance our attitudes and motivations towards our treatment of the planet over the past two centuries. At least it gives us an ideal to work for: if we’ve damaged a landscape, we can heal it, and redeem our obligation, fulfilling our ancient commitment and responsibility as spiritual and physical beings in this world. That sounds and feels right. We (often) say and dream it and proclaim it. But like you, I’m not sure whether or how (or how much) it will happen. For you rightly phrase it as an open question: will it “ever be possible to return such a sense of the sacred to landscapes that for at least the last couple of centuries have been viewed as profane?” We’ll answer that question with our lives, not just our words. And people of the next couple of centuries will judge and live with the results. *My wife took this vivid image as part of a color study she is doing of native hues and patterns. 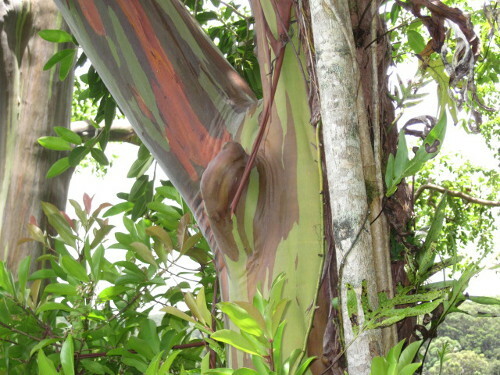 Eucalyptus trees flourish along the Hana Highway, a very winding road along the northeastern coastline of Maui. Much of the area is tropical rainforest, though if you continue beyond Hana along the highway, the land transitions to desert in the southeast. One of the marvels of Maui and the other islands in the Hawai’ian chain is just how much climate diversity they exhibit over just a handful of miles in planetary terms.